I am seeking info on painting Hessian generals in the AWI, specifically their uniforms and their shabraque. I have read that they typically wore the uniform of their regiment, but what additional details might a general have worn? Any pictures would be excellent! I've been painting the General in the uniform of his regiment, if known. I default to red facings. I paint the saddle cloth in the facings color. Of course that could result in a yellow saddle cloth, so I paint it red. 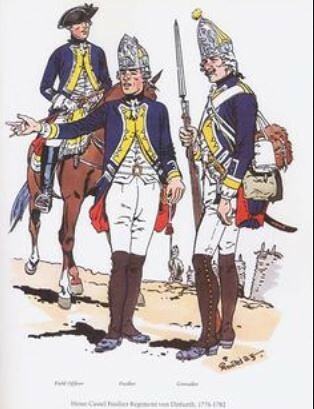 The Prussian model, which the Hessian army seemed to follow, was to add a border of short white feathers to the hat. It was this feather trim which distinguished Prussian generals from the other officers as the uniforms all followed the same pattern.